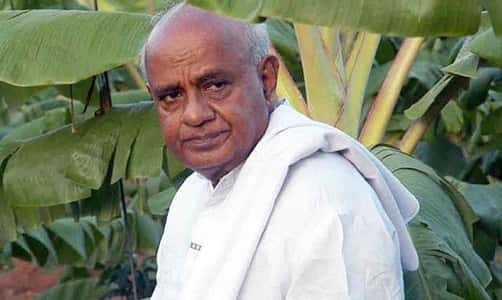 A well known name in the Indian politics scene, H.D Deve Gowda is well regarded for its contribution all around. H.D Deve served as the 11th Prime Minister of Republic of India who took the reigns from Atal Bihari Bajpayee. He had also served as the Chief Minister of Karnataka before taking the command of national leadership. He was known for its leadership skills and the way he managed to guide the state of Karnataka and later on India. He hailed from a normal family and had the percussion of staying humble all around throughout his life. He held a diploma in civil engineering and had a fruitful education in his life. His tenure was lesser than those previously who held the office in Prime Minister’s cabinet but was known for some good deeds that he performed during his time. We here today cover the life of H.D. Deve Gowda in our series of looking into the historical figures of Indian politics. We will look into career of the highly acclaimed H.D. Deve Gowda and present it to you. D Deve Gowda was born on 18th May 1993 in an village named Haradanahalli. The village is in Holenarasipura taluk of the Kingdom of Mysore which as present is also known as Hassan, Karnataka. He was born before the Indian independence when India was into the British Raj. He was born into a family of Vokkaliga caste, the caste which as per the notification of Indian government is classified into Other Backward Class. His parents were Dodde Gowda and Devamma, a paddy farmer and a housewife respectively. He attained his diploma in civil engineering field from the reputed L.V Polytechnic at Hassan. He earned his qualification into the late 1950’s. He married Chennamma in the year 1954. The lovely couple had six children in total, four of them sons and two daughters. His sons include H.D Revanna and H.D Kumaraswamy who is also the current Chief Minister of Karnataka. He started his political career in 1953 when he joined Indian National Congress. He stayed on as the member of the party till 1962. He was esteemed very highly in the party and even became the President of Anjaneya Co-operative Society of Holenarasipura. He did not only stop there and even became the member of Taluk Development Board of Holenarasipura. He later left the Indian National Congress and became an independent candidate. He even won the seat from the Holenarasipura constituency into the legislative assembly of Karnataka. He held the term for six different elections as he won the seat from 1962 to 1989.He later on also joined the Congress (O) during the split that occurred and even lead the opposition as the leader in the Assembly from a period of March 1972 to 1976. He even served second term as the Leader of the Opposition in the Assembly from a period of November 1976 to December 1977. During the Emergency period levied by the then Prime Minister Indira Gandhi, H. D. Deve Gowda was kept in prison in the Bangalore Central Jail. He later joined the Janata Party and became the President of the State twice during the time. He even became the minister in the government formed by Janata Party in Karnataka from 1983 to 1988 under the leadership of Ramakrishna Hedge. He later became the President of the Janata Dal in 1994 and led it to become the winners of the 1994 State Assembly Elections in Karnataka. He won the seat from Ramanagara in that election. He then became the Chief Minister of Karnataka in December 1994. His tenure as Chief Minister of Karnataka saw him make a trip to Switzerland as part of the Forum of International Economists. He also made a trip to Singapore from where he brought plenty of foreign investments to Karnataka. A prominent party Janata Dal, one which has held plenty of roles in the Indian political stream, has its linkage to H.D. Deve Gowda. The party was initially formed by the Jayaprakash Narayan who during the 1977 national elections united all the parties under one banner of Janata Party. Then later on in the year 1988, Janata Dal as a party was formed after the merger of plenty of small parties with the Janata Dal. Janata Dal even lead the elections in the 1989 and formed the National Front government under the leadership of Vishwanath Pratap Singh. The party has a celebrated history as later on Deve Gowda and Inder Kumar Gujral also became the prime minister of the Republic of India as part of the United Front government in the years 1996 and 1997 repectively. However, Janata Dal did not run for long as many top level politicians joined the BJP party and that created many fragments of the Janata Dal. Another faction of the Janata Dal was formed with the name Janata Dal (Secular) and was lead by the H. D. Deve Gowda who then became the entire nation’s president of the Janata Dal (Secular). H.D. Deve Gowda was defeated in the 1999 general elections leading the Janata Dal (Secular) but later won the Kanakapura By-elections that was held in the year 2002. He lead the party to rising heights again in the 2004 elections of the state of Karnataka and led it to win 58 seats. That meant that he formed part of the ruling team in coalition with the largest party of Karnataka. Later on in the year 2006, the party then joined hands with the BJP and formed the state government in Karnataka. He gave the reigns of the coalition government from the side of Janata Dal Secular to his son H.D Kumaraswamy. His son ran the rule for 20 months. Later on in the year 2008, when the elections happened again, Janata Dal Secular performed very poorly and won only 28 seats. Although the results were poor, his party still had a force in the South Karnataka region. His party did not have any much impact in the Karnataka politics for a period of 2008-2018 largely because other parties were in more prominent positions and had better stakes at running the rule over the state. But then in the 2018 general elections, JDS became the kingmaker as his party won 37 seats in the election where BJP had won 104 seats and INC had won 78 seats. Indian National Congress then teamed up with JDS and asked them to form the government. But the governer denied it and asked BJP to form the government and then prove the majority in 2 weeks. BS Yeddyuruppa became the chief minister but he failed to form the majority and could not show it and thus after 2 weeks had to resign. Then INC along with JDS formed the government with H.D. Kumaraswany, son of H.D. Deve Gowda became the Chief Minister of the State of Karnataka. It was in the 1996 general elections, that Congress party lost the election and no other party had achieved enough seats to form an entire government. The Congress party at that time was headed by none other than P.V. Narasimha Rao. In return, a United Front, also known by as the joint conglomerate of the Non-Congress and the Non-BJP regional based parties got the chance to form the government after getting the backing from Congress party. After the United Front got the command to head the government, H. D. Deve Gowda was chosen as the leader of the group and was made the Prime Minister of the Republic of India. He was the 11th Prime Minister of India and succeeded Atal Bihari Bajpayee, the erstwhile Indian leader on 1st June 1996 and ran the office till 11th April 1997. He at that time also leading the Steering Committee of United Front as the Chairman of the group. His task was to formulate and regulate the apex body of all constituents of the United Front party. He is a prominent figure in the Karnataka politics and has served as the Chief Minister of the state. His son H.D. Kumaraswamy is the current chief minister of the state of Karnataka. He during his stint as the Chief Minister of the state of Karnatak made a trip to Singapore and brought plenty of foreign investments to the state in return. D. Deve Gowda held the reigns of the Janata Dal and later on lead the Janata Dal Secular and even headed the national party as the president of it. He later on gave the reigns of the party to his son and his party became the kingmaker in the 2018 state elections of Karnataka. He took over the reigns of Prime Minister from Atal Bihari Bajpayee and served the office for a little more than a year. He holds a diploma in civil engineering from L.V Polytechnic, Hassan.